The parish of Horsham St Faith lies just north of the city of Norwich, about 4 miles due north and just east of the A140 road which links the city to Cromer. Horsham St Faith is nowadays a thriving commuter village with a daily traffic of workers into the city in the morning to return in the evening. At the time of this transcript it was a substantial village within walking distance of the county capital. The parish today is dominated by the close proximity of Norwich Airport which was developed from a World War II air-base. This not only took large tracts of agricultural land but also diverted the A140 which previously ran through the village. The housing clusters around the former junction of the old road with an east-west running lane. St Mary & St Andrew's church is sited at the western end of the village tucked away up a short lane. 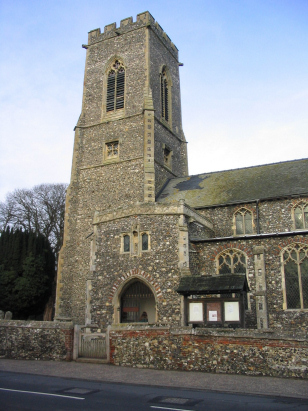 The tower is early and in the Decorated style, most of the rest is typical Norfolk Perpendicular, however the east wall is earlier still and Early English in style rarity in Norfolk. The church was undoubtedly founded associated with the former Benedictine Priory (which commenced in the early 12th century). 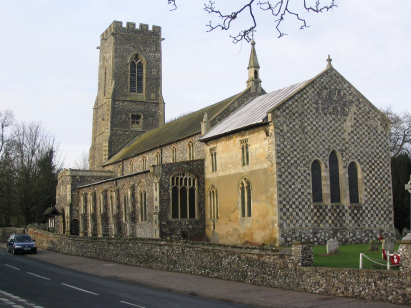 In common with most Norfolk churches there was much restoration and change during the Victorian era. Three register books cover the period of this transcript. The first a 1600-entry book was abandoned incomplete in 1847, the second an 800-entry book was also abandoned incomplete in 1875, the third book continues beyond the period of the transcript into modern times. The registers are all recently filmed starting on microfilm MFRO529 and running through to completion on microfilm MFRO530 in the collection of the Norfolk Record Office. The films are of good quality throughout, however it must be added that at times the standard of handwriting left much to be desired. Subject to that caveat this was a straightforward transcript to prepare and it is hoped few errors will have crept into its production.